I read this article and found it very interesting, thought it might be something for you. The article is called Savor the Moment and is located at https://teamperformanceus.com/2014/12/chicken-soup-2/. I make chicken soup that really is chicken soup for the soul. I have perfected and refined it over time and whenever I make it, I create huge batches of it and freeze it. I want to make sure that the time I spend provides a return on my investment. When I first started making chicken soup I usually rushed through it. It was just one more thing on my to-do list. Although I loved the soup, I was not crazy about the way I was feeling when I made it. I was always rushing against the hands of time. This past time, I choose a different approach to making soup. I chose to make it on the weekend and surrender to how much time it was going to take. Every step I took I found myself awake to the love and joy of making one of my favorite meals. That Saturday morning I was up at 6:30 beginning my giant batch of chicken soup. I chopped and diced and spiced and simmered. And it turned out simply delicious. You know why? I am convinced that by surrendering to the time and enjoying the process it was filled with love, joy and relaxation. I can now step back and smell the chicken soup and enjoy it at a whole new level. Reflecting on this new discovery, I began thinking; how does this chicken soup experience relate to other areas of my life? Does my time investment yield the results that I expect? Do I rush through a walk with my dog Daisy just to check it off my list? Or do we take a new route and look around enjoying the sights and smells of the neighborhood? Do I hurry through a visit with my 90 year old dad during a busy week or do I take the time to sit down, listen and share a few stories about the past few days? What do we all muscle though each day that if we surrendered to the time and moment we might enjoy the ride more and have increased happiness in the end? Most likely, we can all relate to missing the journey and not being present to what is right in front of us. 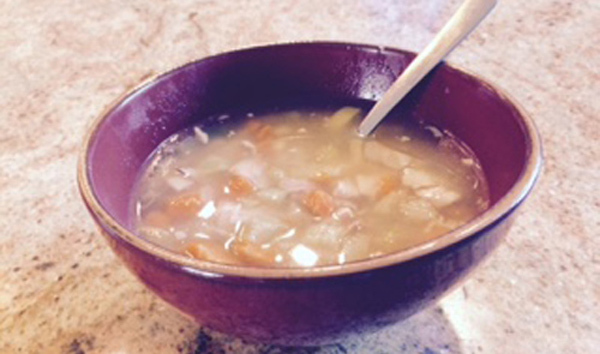 That “Chicken Soup Saturday,” I made a conscious choice to slow down. We can all do that every day with a little mindfulness. Think about what life would look like if we enjoyed the ride, celebrated our small successes and acknowledged the gratitude? How would your life be different? What can you do to be more present to the holidays, the joy of work and all that is in front of you? In January 2104 my holiday letter had an excerpt in it about my year (2013). I talked about how I made an effort to BE PRESENT in everything I did with the family. I am so thankful I did that. Nice article.